Sam Henham was Rye Town Football Club's man of the match in the 5-2 win over Bexhill Town. Following a draw and a defeat the previous two weekends, Rye Town Football Club celebrated its first victory of 2018 on Saturday. Town pulled off a comfortable 5-2 win over Bexhill Town in the Macron East Sussex League Premier Division after opening up a 3-0 half time lead. The result moved Rye up to second in the table, although third-placed Hollington United are three points behind them with four games in hand. With The Salts pitch unfit, the match was switched to Bexhill Road and Rye looked firmly in charge during the opening period on a grey and drizzly afternoon. They opened their account in just the ninth minute, Sam Richardson getting on the end of a cross into the goalmouth and diverting the ball home, although Bexhill’s goalkeeper ought to have done better. One became two in the 36th minute. Kenny Butchers found the far bottom corner with a good finish from the right-hand side of the box and afterwards pointed to the sky in memory of his mum. There looked to be no way back for Bexhill when Rye added a third goal eight minutes later, Richardson scoring his second with a close range header from a corner on the right. Rye manager Shane Ridgers expressed to the players at half time his desire to carry on attacking but at the same time keep a clean sheet. Bexhill pulled one back, however, on the hour. 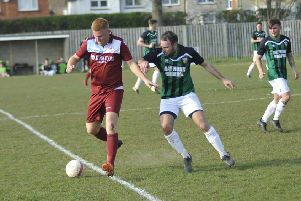 The ball dropped in the box following a set-piece and Doni Dovla rather scuffed a shot into the net with Rye goalkeeper Joe Ramsden unable to get up after a Bexhill player had accidentally fallen on him. Rye restored their three-goal cushion with a fantastic goal in the 72nd minute. A really good passage of play involving the likes of Ollie Skinner, Craig Pierce and Butchers ended with Charlie Stevens crossing for strike partner Richard ‘Alfie’ Weller to tap home. Ramsden - in his first game back from suspension - was yellow carded for a foul on Dovla outside the box and shortly afterwards the prolific Dovla scored his second of the game from a 78th minute free kick. Weller missed the target from a one-on-one situation and Stevens had a shot cleared off the line after the lively Sammy Foulkes rounded the goalkeeper. Rye did score a fifth in the 90th minute when birthday boy Foulkes found the net from a tight angle following a terrific Stevens cross. The Pikes Cleaning man of the match was Sam Henham, who was solid in a holding midfield role, although Richardson was immense in a new defensive role and Luke Willis also played very well. The game was sponsored by Lee Robinson Air Conditioning Services. Dominic Cruttenden, who was thought to be out for the season through injury but is on the mend following some intensive physio work, eased his way back into action as a substitute. And with Foulkes, Ramsden and Stevens all back from suspension, Rye are now back up to strength as they head into the final three months of the season. Rye: Ramsden; Fraser, Richardson, Willis; Butchers, Henham, Skinner, Levett (Foulkes), Pierce (Cruttenden); Weller, Stevens. Weather permitting, Rye will visit bottom-of-the-table Crowhurst this coming Saturday. Kick-off in a match sponsored by Cinque Ports Sweep is 2pm.